Coliban Water is one of the largest regional urban water corporations in Victoria. Based in Bendigo, it provides water and wastewater services to a population of more than 146,000 people across an extensive service area of 16,550 square kilometres. The State-owned business manages, maintains and operates more than 50 reservoirs and water storage basins within a service region including 49 towns across central and northern Victoria. Members of Coliban Water’s Rural Services team are responsible for operating and maintaining around 450 kilometers of water supply channels. 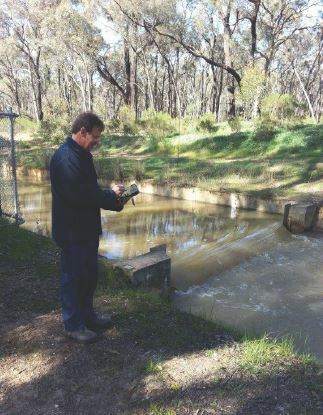 This channel system transfers water to the towns of Bendigo and Castlemaine and supplies water to 1,350 rural customers from Malmsbury to north of Bendigo. The team use a water scheduling and billing system to deliver water to customers and record the water volumes supplied. Due to the large service area within which they operate, team members spend most of their time on the road and working remotely. Until recently, they used laptops to schedule site visits and record water volume data, but increasingly found them to be cumbersome to use in the field. With this challenge in mind, Coliban Water approached Gamma Solutions to explore a better solution to allow the Rural Services team to perform their roles more efficiently supported by fit-for-purpose technology. Stephen Lakey, Business Development Manager at Gamma Solutions spoke to the Coliban Water team to thoroughly understand their requirements and the challenges.